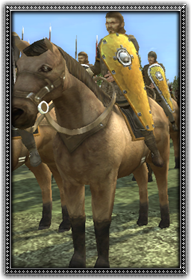 Mounted Sergeants are the lesser armed cavalry that ride in support of the knights. They comprise squires, rich commoners, or lesser nobility that cannot afford the expensive armour of a real knight. Although they cannot compare to real knights in battle, with their spears and swords they can perform valuable service against lighter enemies.